A revamp version is up! Animal abuse is increasingly rampant in Malaysia, with senseless abuses and killings by local councils and cold-blooded people. We must act NOW, and act FAST. 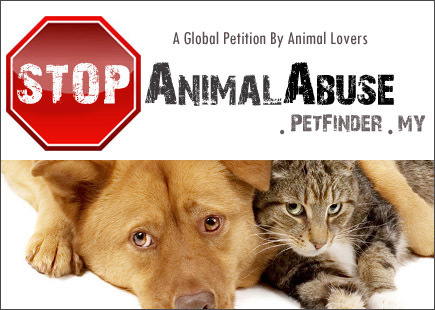 Let's play a role in stopping animal abuse and cruelty! We aim to collect 50,000 signatures ASAP and present it to our Prime Minister. Please sign the joint online petition by leading Malaysian animal welfare NGOs, and show how much you care about the animals. Spread the word to your friends too. Having this new goal of giving a new look for this blog. To make more mature I would say. Packed with beauty tips and be an informational blog that you would not miss to be updated with.